It’s been over twenty years since the American premiere of MATTHEW BOURNE’S SWAN LAKE at the Ahmanson Theatre in Los Angeles, and Bourne has reimagined and redesigned his signature work for an eight-week season at Sadler’s Wells. Initially trangressive in its use of an all-male wedge of threatening swans—replacing the traditional female corps de ballet—the world has caught up with Bourne’s vision as new audiences discover this enduring masterpiece. In London, The Swan will be alternately danced by Matthew Ball, Will Dozier, and Max Westwell. The Prince will be played by Liam Mower, Dominic North, and—making his professional debut—James Lovell. Sadler’s Wells, Rosebery Avenue, Clerkenwell, London. Matthew Bourne’s Swan Lake in performance. Freya Field and Will Bozier. Matthew Ball (left) and Mower. Image credit: New Adventures and Sadler’s Wells. This entry was posted in DANCE and tagged Ahmanson Theatre, Dominic North, Freya Field, James Lovell, Johan Persson, Liam Mower, Matthew Ball, Matthew Bourne, Matthew Bourne's Swan Lake, Max Westwell, Nicole Kabera, Sadler's Wells, Will Bozier on December 4th, 2018 by Barlo Perry. When the British film THE RED SHOES first opened in 1948, it was largely met with indifference in its home country. But upon its release in Manhattan, it played continuously for two years, and during the Los Angeles engagement, an MGM contract player went to see the film once a week for a year. In anticipation of the local premiere this month of Matthew Bourne’s theatrical production of THE RED SHOES at the Ahmanson, LACMA and the American Cinematheque have programmed screenings of the Michael Powell/Emeric Pressburger masterpiece. After the LACMA screening this weekend, stay for the panel discussion “Designing for Dance,” with costume historian Bobi Garland, creative movement director Stephen Galloway, and artist and designer Stacia Lang. THE RED SHOES, in 35 mm, Saturday, September 2, at 2 pm. THE RED SHOES, in 35 mm, Friday, September 22, at 7:30 pm. MATTHEW BOURNE’S THE RED SHOES, on stage from September 15 through October 1. AHMANSON THEATRE, Music Center, downtown Los Angeles. Top: Moira Shearer and Anton Walbrook in The Red Shoes (1948), written, directed, and produced by Michael Powell and Emeric Pressburger. Bottom: Léonide Massine and Moira Shearer in The Red Shoes. This entry was posted in DANCE, FILM, THEATER and tagged Ahmanson Theatre, American Cinematheque, Anton Walbrook, Bobi Garland, Egyptian Theatre, Emeric Pressburger, LACMA, Léonide Massine, Matthew Bourne, Matthew Bourne's The Red Shoes, Michael Powell, Moira Shearer, Stacia Lang, Stephen Galloway, The Red Shoes (Powell-Pressburger) on August 31st, 2017 by Barlo Perry. 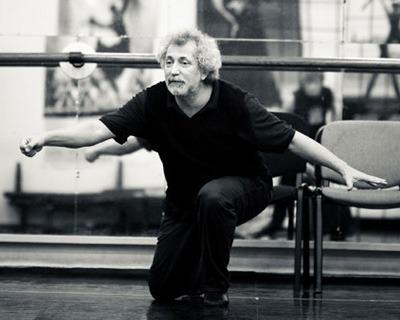 Choreographer Boris Eifman has created ballets based on the lives of Anna Karenina, Don Quixote, the dancer Olga Spessivtseva (Red Giselle), Rodin and Camille Claudel. A sort of Russian cousin to Matthew Bourne, the two entrepreneurs share a love of recent history viewed through a pop aesthetic that can shade toward camp, if not kitsch—a tendency that delights their fans if not their critics. This weekend, as part of their 40th-anniversary North American tour, the Eifman Ballet of St. Petersburg brings a revised TCHAIKOVSKY to the Music Center. For dance audiences, Tchaikovsky’s music is irrevocably tied to several ballets, and in creating his piece, Eifman has avoided making obvious connections. The fact of the composer’s homosexuality has always been suppressed in his native Russia. How much of that tortured history—Tchaikovsky’s and Russia’s—Eifman addresses will be seen onstage at the Dorothy Chandler Pavilion. TCHAIKOVSKY, Friday and Saturday, June 23 and 24, at 7:30 pm. Sunday, June 25, at 2 pm. This entry was posted in DANCE, PERFORMANCE and tagged Boris Eifman, Dorothy Chandler Pavilion, Eifman Ballet of St. Petersburg, Matthew Bourne, Tchaikovsky (Eifman) on June 22nd, 2017 by Barlo Perry.